Back in December 2011, I received a copy of The Future of the Electric Grid from the MIT Energy Initiative which was an interdisciplinary study on meeting the challenges of the U.S. grid as it ages and evolves. It helped to give me a better understanding of the U.S. electric system. 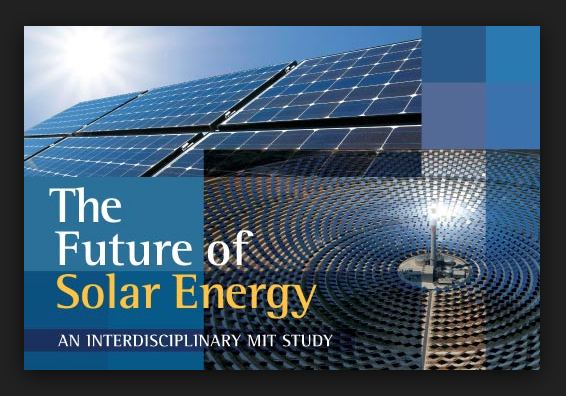 So I was happy to learn yesterday that another study, The Future of Solar Energy, was released in May and added to a whole series of "The Future of . . ." studies and reports to help inform on key elements of our complex clean energy transformation. Although I have not read through the entire report and just viewed a video of the report's launch at the National Press Club in Washington, D.C. and read the Executive Summary, its analysis of residential roof-top PV systems and net-energy metering (NEM) should give one pause on the non-PV ratepayer and taxpayer subsidy issue. No wonder The Alliance for Solar Choice (TASC) is working so aggressively to try to gain political support throughout the country to maintain the status quo. With this level of economic, technical and policy analysis, the only way TASC can preserve the exponential growth of its business model is through politicians. To accomplish this, TASC tries to mobilize "grassroots" support by its hyperbole. Sure, we all want clean energy - but follow the money! The video launch event is a good primer on the solar sector in general, besides getting the gist of the report. But as you watch the video, just remember PV and wind integration levels on Hawaii's isolated island grids have surpassed the general analysis of this report (there's a little mention of it). At around 45 minutes into the video there is some discussion on NEM and toward the end at around 1:11. There is also a good explanation on the "duck curve." Two influences on PV pricing are peculiar to the U.S. residential market and to the third-party ownership model. One is the effect of current federal tax subsidies for solar generation: a 30% investment tax credit (ITC) and accelerated depreciation for solar assets under the Modified Accelerated Cost Recovery System (MACRS). Third-party owners of PV systems generally need to operate on a large scale to realize the value of these provisions, which creates a barrier to entry. In addition, because there is generally little price competition between third-party installers, PV developers often are not competing with one another to gain residential customers, but with the rates charged by the local electric distribution company. Some of the largest third-party solar providers operate as vertically integrated businesses, and their systems are not bought and sold in “arm’s-length” transactions. Instead, for purposes of calculating federal subsidies they typically can choose to estimate their units’ fair market value based on the total income these units will yield. In a less than fully competitive market, this estimation approach can result in fair market values that exceed system costs and thus lead to higher federal subsidies than under a direct sale model. Where competition is not intense, subsidies are not necessarily passed on to the residential customer. Some people associated with TASC have accused me of being anti-solar. No, I'm not against solar but I am against the non-PV ratepayer and taxpayer being fleeced and the the public being hoodwinked by TASC's deceptive campaign and hyperbole.